Welcome back to Charity Corner. This is my new series where I will be using my blog as a platform to lend a voice to different charities and organisations of all sizes, backgrounds and causes. In today’s Charity Corner, I speak to director – Hannah Morgan – at Heads Above The Waves, which supports people dealing with mental health issues. What is the mission of Heads Above The Waves? We’re a Not For Profit Community Interest Company (bit of a mouthful!) that supports young people dealing with self-harm and other mental health issues. We encourage people to use creative coping techniques to replace their negative behaviors, and to speak to people about their problems and access help when they’re struggling. 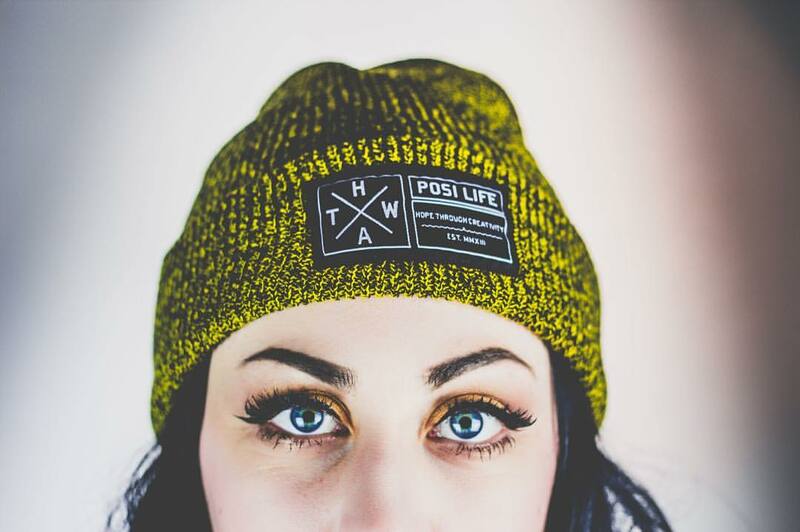 We tackle stigma through merchandise with positive designs on, we share stories, places of further support and coping techniques on our website and across our social media channels, and we speak at conferences and gigs/ music festivals, as well as delivering workshops, PSE days and training. What is the story behind the creation of your charity? Si struggled with self-harm as a teenager and had used drums and playing in bands as a coping technique. I had dealt with addiction and alcoholism after being bullied growing up and after the death of several family members and friends. We met with another friend, after Si voiced that he wanted to create some form of support for young people that spoke to them on their level, which he felt hadn’t been around when he was growing up. Thus Heads Above The Waves was born! Si got some funding through his work at the time to print a small run of t-shirts with a positive message on them. These were aimed to get people talking and break down the stigma around mental health. That’s grown into a website, various social media channels, school workshops, events and speaking at national conferences! What outcomes has HATW seen through its work? When we started we always said “If we can help even just one person, then it’s all been worth it”. We’ve been fortunate enough to have contact with a really wide range of people from different walks of life, different ages and backgrounds. And we’ve heard so many positive stories of how the blog posts or the positive images we post on Instagram have been seen and read at really low points for people, and have helped them or made them feel more positive. In the school workshops we’ve seen amazing transformations of students from being really withdrawn and unable to voice what they’re going through- to people being positive and putting self-harm behind them which is amazing! As a not for profit, any money that’s donated to us goes straight back into the organisation- and helps us pay for things like transport to workshops, supplies for school sessions, printing literature with the coping techniques on it, upkeep of our website, and as a way to create content. How can people help HATW besides just giving money? There’s a section on our website that details all the ways people can get involved- check it out on our website. 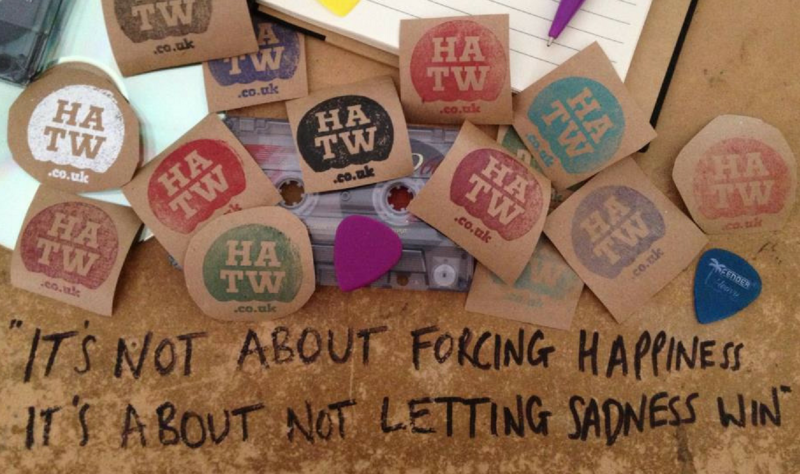 This can range from volunteering with general admin or helping out in the shop- or even just sharing our social media posts of tagging us in photos of any HATW merch- it all helps and raises awareness of what we’re trying to do! 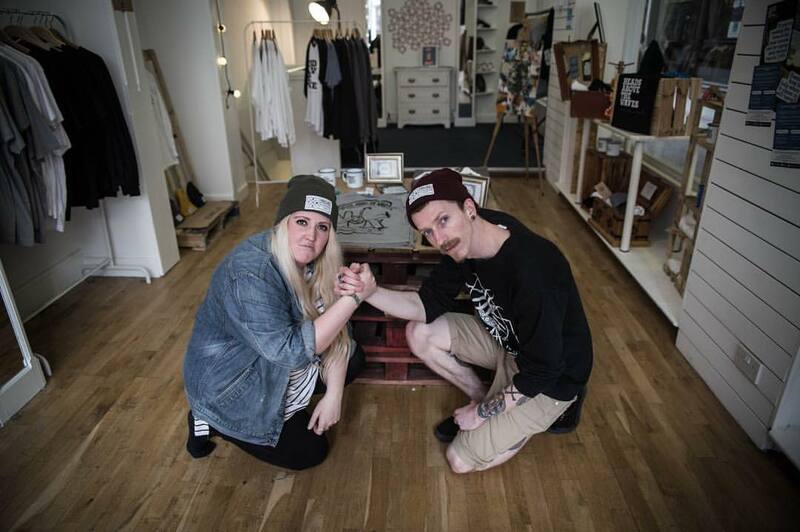 Opening a pop up shop last year was a big turning point for us. It meant so much that people believed in us and our work enough to give us a shop space. We used the space to sell our merch but also as a safe space in the center of town for young people to pop in and have a chat about their mental health or to chill out of they felt anxious. It went so well in the first month we were allowed a second month too which really helped establish us and get our name out there. In those two months we also re-launched our website which we’d been working on since starting 4 years or so ago- and this has been a massive advancement for our work too. The website is something we’re really proud of, as we can see how much it benefits people looking for help, or wanting to read about other peoples stories and how they’ve got through their darker day. It’s definitely become what we hoped it would be- a useful resource for someone needing help, or for someone supporting a loved one who is struggling. The pop up opened so many doors for us including the opportunity for a permanent shop space we have now in the castle emporium on Womanby Street in Cardiff. It put us on the map and made us feel like a real organisation that had people depending on us to keep going, which in turn keeps our heads up now in tough times. What does Heads Above The Waves hope to achieve in 12 months time? We hope to be reaching even more people and helping in lots of different ways. We’re aiming to still have the shop running, and still be producing merch that people want to buy (that helps get people talking about mental health). We’d love to be doing even more school workshops, PSE days and training sessions and we hope to speak at lots more events to inform people and affect policy change and get more support available out there. Where can people find more information on HATW?